If you do not want to lose your experience, keep it in a chest. 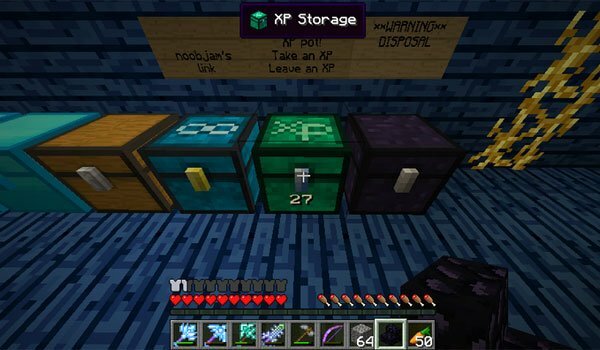 XP Storage Chest 1.7.2 is a mod that lets you create a new type of chest where to keep our experiences and collect it when we want. Tthis chest has a similar design to the normal Minecraft chest and adapts, or rather allows us to place with any other kind of chest, both predefined as any other mod. The only thing you need to use this new box is experience, then simply squat and right click on the box, so the experience is trasfered to the chest. To get the experience back, we just do the same process. If you break the chest, an orb, with all the experience that you kept, appears, so if you break it by mistake, nothing happens. How to install XP Storage Chest Mod for Minecraft 1.7.2? You got experience locker storage! dude how do u make it? easy recipe; just make a chest but add an emerald to the empty center grid space. not that i will ever find a town… hehe.